Barry showed this video to me and I thought I would share this beautiful video with you. This is not your typical sand art in a bottle. It is absolutely beautiful. This artist is amazing!! I never knew you could make such beauty with sand. I hope you enjoy. On my trip I saw many artists doing their crafts. Below is a lady making baskets In Williamsburg VA. I would like to learn how to weave baskets. I will have to put it on my to do list for next year. I enjoyed watching her weave the baskets. So soothing. This is embroidery made in the 17th century. Isn't it gorgeous? This is a paper quilt. Amazing work. I can't even count how many hours they must have put into this piece. I am only showing 1/8th of this piece. I accomplished another resolution. I learned how to spin merino top from a lady in Williamsburg. The class was an hour long and I was amazed at how much I learned in an hour. My mom on the other hand had some trouble not letting go and letting go when your not supose to let go. I ended up with her supplies. I guess she is going to stick to Fine Arts. She is an amazing painter and can draw anything. I did enjoy her being there with me. Yeah for Barry who suggested to take the class. He is so very thoughtful. Thank you, Thank you!!!!! This is me right after I just started. Can you see the euphoria? This was in the museum in Williamsburg. Maybe I will spin yarn on a wheel one day? On my trip I finally finished knitting my first sock. Whew. I had to start on the other one right away, because when I put it on my foot it felt amazing. Now I understand why knitters knit socks. I can't wait to finish the second one. I am on the decrease gusset. Not to far to go now. /I can do it!!!!! I can do it!!!!!! All most there!!!! Ahhhhhhh sweet bliss!!!!! There are some imperfections in the sock, but at least I learned from my mistakes. I didn't have anyone to teach me how to knit a sock, so I think I did pretty good. Maybe I could take a class, I don't think I understand picking up stitches. My second sock where I picked up stitches looks odd. > I went to a real Yarn shop in Charlston SC. called Knit. I got some Koigu, Noro, and Addi Turbo needles so that I can knit 2 at a time socks. So exciting. Then my mom got me artyarns Beaded Mohair and sequins yarn it is so yummy and soft. It has silk in it. I couldn't believe the cost. Amazing yarn. it is so beautiful. Thank you mom. I held the yarn in the car for a while. I even cried. I couldn't get over how beautiful it is. It is resting in between the Noro yarn and koigu. Thank you so much mom once again. Geez I am gonna cry again, I just can't believe she bought it. It doesn't say Joann on it that is for sure!!!! I sat in the car awhile with the yarn all around me. I think I may have issues. I am an addict. There I said it I have a problem. I am addicted to yarn!!!!!!!!! and I love it!!!!!!! I will have to do another post on the rest of my trip. This one I just had to get out. I'm back from vacation. I did so many things!!!! I can't wait to show you pictures. 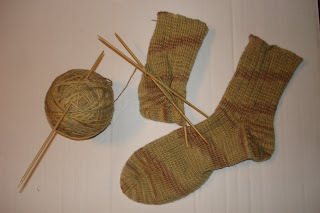 I did want to say that I finally finished one sock and started the other right away. I am at the decrease gusset. It is amazing what you can get done when you are riding in the car for hours. 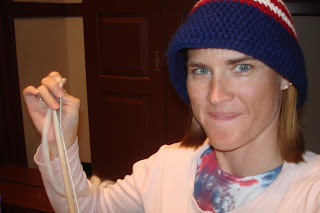 I also took a spinning class and spun some yarn!!!! I will post pictures soon. I also went into a real yarn shop. It was amazing. I will write a new post soon, I just wanted to let everyone know that I was back and leave some sort of update.